After the success of our spring/summer shoot for our client, Brodie Cashmere, we rolled up our sleeves ready to take on autumn/winter. With more than 60 different looks to shoot, 20 pairs of shoes, two studios and one beautiful model in the shape of Georgina Toms, the full creative photography team from Pure Agency were ready. Prep started weeks in advance, choosing a wintery colour palette for backgrounds to complement the cashmere, commissioning bespoke builds for interesting shapes and frames and sourcing cool flooring surfaces. After tonnes of moodboards, Pinterest sessions and brainstorms, the overall feel for the shoot was decided. We chose to tie the shoot in with the previous spring/summer offering, utilising similar shapes and background styles but this time in darker, moodier tones befitting of the season. The shoot itself was a whirlwind of hairspray, snacks, retouching on-the-go, two-minute outfit changes and speedy set switches. Our in-house illustrators had designed and sketched amazing blackboards covered in cities that Brodie Cashmere loves and works in. Our lovely client had spotted some angel wings in LA and loved the striking images people got in front of them… we decided to recreate our own for the shoot and love the overall look! Following the shoot, Pure Agency’s in-house designers pulled together a beautiful lookbook for Brodie Cashmere to use, showcasing all the shots from the shoot. Using a scrapbook style throughout, we overlaid images on top of quirky backgrounds, fun patterns and a smattering of stars. You will see from the snaps that the brief was achieved. 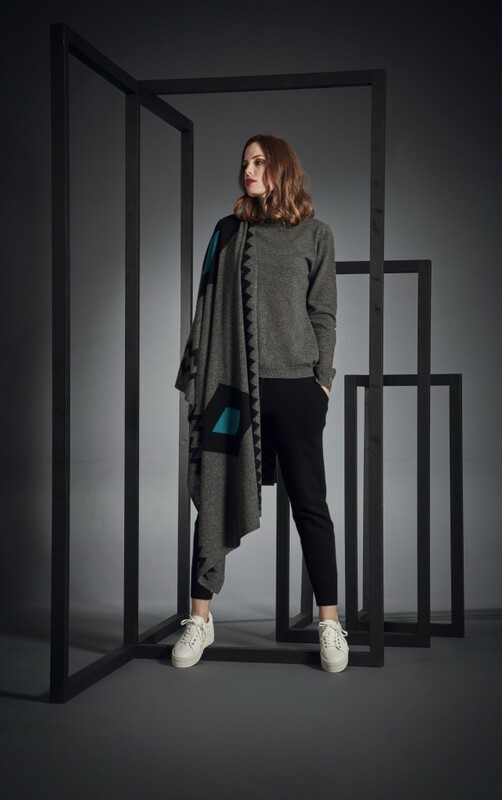 Classic cool styling interspersed with light-hearted poses and muted sets; Brodie Cashmere’s autumn/winter lookbook is complete for another season!